Are you thinking about becoming an affiliate marketer? Do you want to learn more about affiliate marketing? Are you struggling to increase your affiliate sales? If yes, you’re in the right place where you’ll discover the complete guide to affiliate marketing to make more money in 2019 and beyond. Affiliate marketing isn’t a BIG deal if you know how to sell. Anyone with certain skills can earn more money from affiliate marketing. The major reason most people don’t make even a buck from affiliate marketing is this, they sell products directly to their readers or customers without knowing their needs and wants. What happens when you directly sell online products like that? No one cares about buying your products. The simple rule to making more money from affiliate marketing is “injecting trust and offering great things that no one else offers”. So let’s get started with the most basic yet essential question first. Shall we? Why 99% of beginners never make even ONE affiliate sale? Affiliate marketing is the process of earning commission by promoting others products. You earn commission for every successful sale you make. Affiliate marketing is one of the best ways to make passive income from online. That means, you make money even while you sleep, isn’t it a great idea? So how does affiliate marketing work? If you’re wondering about how exactly affiliate marketing works, here’s a simple explanation for you. 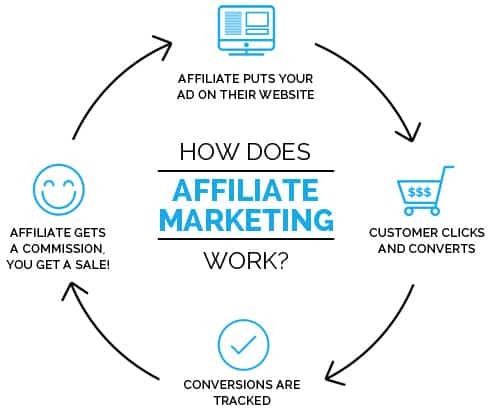 Here’s a great illustration which explains more about how affiliate marketing really works. We hope that you understood what affiliate marketing is all about and how it works. Let’s now get into the details of how you can use affiliate marketing to make more money in 2019. The first step to making money from affiliate marketing is building BRAND through your online businesses. When you are featuring everywhere in the blogosphere, people will trust you and they recognize you as an expert in your field. That’s how can build online reputation as a blogger or Internet marketer. The more people talking about you and your business, the better it is for you to make money out of affiliate marketing. Your affiliate marketing success depends on the products you choose to promote. Picking the right affiliate products to promote is the key to generating more affiliate commission no matter what industry you are in. So if you’re just getting started with affiliate marketing, how are you going to find the best products that are suitable for your target audience? Here are some powerful ways to choose great products to promote as an affiliate marketer. Create a spreadsheet and make a list of all of your competitors websites. The higher number of sites the better it is for you to find great products to promote. Make sure your competitors list is at least 20 to 30 sites. Once you’re done with it, start finding all the affiliate products your competitors promote on their sites. Yes, just do it. Then, make a list of all the potential products that you think are suitable for your target audience. Brainstorm all the products that you’re already using to run your blog (hosting, email marketing software, domain registrar and so on), then find out ways to promote those products to your target audience. You can also use affiliate marketing platforms for finding a ton of products to promote on your affiliate marketing website. Here are few of them where you can sign up for free. The above simple exercise is enough for you to choose a ton of great affiliate products that you can promote on your website to make more commissions. That being said, here are few tips for finding best products for affiliate promotion. The first thing you need to remember for successful affiliate product selection is NOT to pick too many products at once. It’s better to choose 2 to 3 products when you’re just starting out so you can get a better idea about what they are all about including their pros and cons so you can promote them more effectively to your blog audience. Before you pick a product to promote, make sure to start using it so you’ll get a sight of their features and benefits. This is especially true when it comes to promoting internet marketing products. Consider high price products. The more we get into affiliate marketing, the more we’re realising the importance of promoting high priced products. Not only they give you huge commission per sale but most of the high priced products usually offer top notch features so they can be sold out in almost any industry. You must know how successful affiliate marketers are making millions of dollars every single year. If you observe top marketers, you’ll notice one thing too often: they all create incredibly amazing content. Content is one of the most important pillars of building a successful affiliate marketing site that generates more sales each week. Here are few of the content types that you can use to drive more affiliate sales to your sites in 2019. Let’s talk about each one of them in detail now so you can better understand how these content types help you increase your overall affiliate sales. Google always rewards the sites with long form of content. Even if you’re running an affiliate marketing website, you can still use long form of in-depth how to articles around your affiliate products to start getting higher rankings on Google search. Here’s an example post of how we wrote a detailed case study of SEMrush (one of the few products that we promote here at Bloggers Passion regularly). Have a look at the following screenshot to see how Google treats long form of how to articles even if they are product-based content. The above illustration shows you that, Google is also showing us the SiteLinks for the case study we wrote for the affiliate product which is SEMrush. Creating useful reviews around the products you promote is probably one of the most effective content types you can use to generate more affiliate sales. Almost every affiliate marketer creates product reviews to increase their commissions. Just pick the product that you want to write a review about. Use it for some time so you will get an idea about its features, pros, cons and write everything you know about those products. Here’s a nice example of writing unbiased product reviews to drive more affiliate sales. And here’s a great example of how to write captivating titles for reviews. The key to use product reviews to generate more sales is to make them unbiased. Don’t promote a product just for the sake of increasing your commissions, do it because you want to help your audience to pick the RIGHT products that solve their problems. That way you can easily convince more people to buy products from you instead of your competition. Have you ever seen the most successful affiliate website Wirecutter? It’s a product review based website which was sold to The New York Times recently for a whopping sum of over $30 million dollars. Wirecutter website mostly publishes list roundups where they create a compilation of a list of products their audience can pick (by including their affiliate referral links within them). This kind of content always works like a charm if you’re running affiliate marketing based website, so give a try and include list roundups within your content marketing strategy. Just like product reviews, product comparisons work like a charm too. You just need to find two or more highly relevant affiliate products to create product comparison posts that easily go viral online and help you increase your affiliate sales. If you’re looking for an example, have a look at this comparison post so you can get a good understanding about how to create comparison posts for your affiliate products. In the above illustration, you can see that, we compared two of the amazing and highly relevant affiliate products along with their features and pricing (we also included a strong call to action). Yes, we all know textual format of content and product reviews work really well both in terms of increasing your search traffic and sales. But if you’re ignoring the second biggest search engine like YouTube for affiliate marketing, you’re missing a lot of potential traffic and sales to your affiliate website. Create informative video tutorials about the products you promote so you can include them within your blog posts as well (or attract new set of visitors from YouTube). Video product reviews convert really well as they are easy to digest and you can include all your affiliate links within your video description. You can’t succeed in affiliate marketing if you’re following the crowd. If your competitors are using articles to promote their affiliate products, you start doing webinars. That way you can add more value to your audience by also promoting your products with ease. Promoting your webinars through webinars has the following benefits. So what are you waiting for? Start using the above PROVEN content types to increase your affiliate sales. Did you know that most of the successful bloggers earn 70 to 80% of their income from their email list? Yes, that’s true. Successful marketers like Ramit Sethi, Pat Flynn, Neil Patel drive most of their sales and profits from their email lists. If you are someone who is looking to dive into affiliate marketing to make more money in 2019 and beyond, your first priority should be building an email list and growing it. Without building an email list it’s almost impossible for you to turn your website visitors into leads and then leads into sales. An email list is what gives you permission to market your products to a list of targeted people who are interested in buying your products. So you can say an email list works like a money printing machine (not exactly though, you’ve to work really hard for it). Email list is what gives you the highest ROI! That being said here are some of the proven ways to build an amazing email list which helps you increase your affiliate sales no matter what industry you are in. Offer an incentive or a freebie such as ebooks, videos, plugins, themes or anything that is considered as a valuable source for your target audience in your industry. That way you can easily convince your website visitors to join your email list by collecting your incentives. This is one of them fastest and easiest ways to build and grow an email list which is also the widely used methods for list building. Use the right email marketing software to automate your email newsletters so you can send automatic broadcasting emails to your subscribers as soon as they join your email list. This is also one of the most effective ways to build rapport with your email subscribers. Place your email optin forms at the right places on your website. You can include them on the sidebar, notification bar, footer, about us page and within your blog posts to turn more visitors into subscribers. Pop Ups also work like a charm until they are NOT distracting your audience too much. Selecting the best products to promote is one thing and promoting them effectively to reach wider target audience is another thing. Your affiliate sales majorly depends on your promotion tactics. Here are few top ways you can promote your affiliate products effectively to increase sales. Create a “Tools we use” page: One of the easiest ways to promote your affiliate products is to create a resources or “tools we use” page and send your website visitors to those pages. Just make sure to include a list of all the affiliate tools that you use and recommend (along with your affiliate referral links) and you’ll be getting more and more sales as your site and readership grows. It’s as simple as that. Create an email sequence for your best products: If you’re already building an email list, create an exclusive email sequence (5 part or 7 part email sequence) where you can educate your email subscribers about your best performing products so you’ll get even higher conversion rates and more sales. Make full use of Black Friday season: Black Friday season comes only once a year which lasts usually for a week in the month of November. That’s the time where most affiliate product vendors offer up to 90% discount on their products. So make sure to use that season to the fullest to convert as many people as possible into buyers. Create income reports: Pat Flynn’s blog is famous for income reports. He publishes his earning reports every single month sharing all his traffic sources along with his income sources. People love to read, comment and share these kind of posts (even we love them and we usually publish income reports once in a year). If you want to get known as an expert and genuine guy in your industry, think about posting earning reports even if your commissions are low. That way you can attract loyal audience around your blog. Conduct a product giveaway: Giveaways work like a charm and they easily go viral on social media sites. If you want to get more visitors or subscribers, think about doing in a giveaway around the products you like (make sure they are relevant to your website topics, so you can only attract target audience instead of freebie seekers). Here’s a great example of how giveaways always go viral online. The only way to succeed as an affiliate marketer is to scale up your earnings and keep growing big in sales and commissions. That’s how an average affiliate marketer becomes a super affiliate marketer. If you’re wondering about how to scale up your affiliate commissions from a pitiful of sales to a ton of affiliate sales each week, here are few proven strategies you can use. Listen to your target audience needs and wants. Most successful marketers are successful because of one reason: they LISTEN to their customers. If you want to increase your affiliate sales, you must find out what your target audience truly wants. Only then, you can serve them better by producing the right content and promoting the right products that solve their problems. Spy on your competitors tactics. The best place to increase your affiliate sales is to find out what different tactics your competitors are using on their websites to boost their affiliate sales. You’ll get a plenty of useful ideas if you’re carefully analysing your competitors sites, promotion tactics and monetization ways. Keep learning. Most people stop learning once they start getting decent affiliate commission. You shouldn’t stop. Your growth starts when you start learning more. You can read marketing, psychology and business related to books to find out your audience pulse (you can also easily know what makes people buy by learning some human triggers). Use your analytics and data to your advantage. Most people don’t spy on their affiliate commission analytics, if you’re also one among them, you should stop ignoring the importance of tracking your sales. The you learn about how you’re getting sales, the better you’ll understand about increasing them. Optimizing your website for more affiliate sales is as important as promoting your affiliate products. Here are some of the most effective ways you can optimize your website for more sales. Landing pages convert like charm when it comes to increasing your overall website conversion rates and sales. Landing pages give less distraction to your website target audience (because they often include just one or two call to actions). Here’s a great illustration of how to build landing pages for high conversions. If you look at Bloggers Passion design, you’ll notice that we use a compelling banner ad for SEMrush in the sidebar. Do you know why? Because we know that banner ads are golden and they increase your affiliate sales if used right. Most of the affiliate programs offer banner ads (which are premade by them) that you can easily use within your home page or sidebar to effectively increase your sales. Or if you’re looking for unique way of promotion, you can design unique appealing banner ads for the products you promote (make sure to take permission from the product vendors before you do it). Don’t tell them to buy, RECOMMEND! Do you know the ONE secret that successful affiliate marketer Pat Flynn uses on his blogs to create more income from his affiliate sales? It is.. he never asks his readers to buy his affiliate products, he just recommends it by telling how the particular product helped his business, this way he can be able to generate more money because he is not being fishy. Moreover he is building trust on his readers by making them aware of the products that he promote. For example, Pat never directly asks his readers about purchasing Bluehost (one of the best hosting services), he makes them buy by creating a 4-minute WordPress free setup guide by creating video, writing articles and using banner ads. This is how he is able to generate a whooping sum of $30k each and every month by only through Bluehost! What’s in it for them if they buy from you? This is another important aspect of selling more products from your affiliate campaign – always ask yourself this question “what’s in for them to buy my products?”. When you give people strong reasons to buy your products and when they find it more useful to buy from you than anyone else, your affiliate sales can definitely go viral. A little trick is to create premium products on your blogs and give it away for free whoever buys stuff through your affiliate links! For example, if you’ve a $37 eBook guide (which you actually sell to your blog visitors), you can give it away for FREE for those who buys hosting from your sites. This way you will be able to make more money from affiliate marketing. The difference between a successful affiliate marketer and a newbie is the call to actions. Call to actions (CTA) are most powerful when it comes to increasing your website sales online. Here are some of the powerful call to actions you can use while creating your copy, designing your landing pages or creating product reviews. Just make sure to keep an eye on the CTA’s that your competitors are using to increase their affiliate sales. Ask any affiliate marketer about their favorite website traffic source and most of them will say search engines. That’s the importance of search engine traffic in driving more sales to your sites. SEO is one of the most effective and FREE ways to attract highly qualified visitors from search engines like Google to increase your overall affiliate sales and commissions. By using SEO, you can easily build and grow an email list which you can later use for building rapport with your audience to increase your affiliate sales. Have a look at the following image to know the importance of SEO and long tail keywords. So how can you use SEO to increase your overall affiliate sales? Here are some of the smart SEO tips for affiliate marketers to grow their organic traffic along with affiliate sales. Determine a solid keyword strategy. SEO without keyword research is useless and it’s especially true for affiliate websites. Using the right keywords that your audience are typing on Google is the fastest way to attract quality visitors to your site who are ready to buy products from you. Try to impress your target audience instead of search engine bots. Most affiliate marketers who are trying to increase their search engine traffic always make a huge mistake of optimizing all of their content for search engines and they care very less about optimizing for people (that’s a huge mistake). After all, it’s people who are going to buy from you not search engine bots. Also, Google loves those site that create natural content which is optimized well for humans. Always optimize your URLs by keeping search engines mind. Don’t use lengthy URLs if you want to optimize better and get more search engine traffic to your sites. Smart and short URLs always work like a charm. Start showing product review boxes. If you’re using a WordPress platform, there’s a plugin called Author hReview which helps you easily optimize your affiliate product reviews for search which also helps you show product review boxes so your audience can easily find out what your blog posts are all about. What’s the one thing most industries have in common? Competition. Yes, almost every industry has certain amount of competitors and if you find a niche without any competition, you shouldn’t probably pick that. That being said, if you want to make more money from affiliate marketing, you should analyse your competition thoroughly. Here are some of the best ways you can do that to grow your affiliate sales. Find out your competitors ad copies. If your industry is filled with enough competition, most of them are probably using ads on Google to drive more traffic to their sites. You should find out what ad copies they are using to increase their revenue, so you can calculate the ROI of spending on them. Find what keywords your competitors are using to generate more traffic to their sites from search engines like Google. The faster you know about their best performance keywords, the quicker you can understand about your audience and what type of content to product for your own sites. Find out the backlink sources of your competitors so you can also find ways to attract more links to your site which will definitely help you increasing your organic traffic and sales. Here’s a great video by Neil Patel on how to do organic research with ease (which helps you in competitor research as well). Here are some of the most dumbest affiliate marketing mistakes most people make, avoid them and you’ll be on your way to getting riches through affiliate marketing. One of the most common mistakes we notice that most new affiliate marketers doing is this: they NEVER spend any money on their website. If you want to make more money from blogging, you should be investing first. So don’t dive into affiliate marketing without spending anything. You don’t need thousands of dollars though, but you should be investing on the above essential things if you want to set up a great base for your affiliate marketing website from the beginning. The ugly side of making money online, especially from affiliate marketing is that most people think it as a get rich quick scheme. If you’re also one among them, you should be aware of the fact that it is NOT. Building a successful affiliate marketing website that makes consistent sales takes a lot of time and efforts. You can’t simply make people to buy stuff from you out of thin air. You have to work really hard to get your first few sales. That being said, you’ll earn a lot more commission when you find and promote products that give you recurring commissions. That means, you won’t just get commission for one time but you’ll be getting recurring commissions every single month as long as the customer is paying for the products you promote. This is NOT a mistake though. Selling has more to do with learning. If you learn how to sell online, you’ll be successful no matter what industry you are in. The reason why majority of the people don’t make much sales with affiliate marketing is that they don’t know how to sell online. If you’re also one among them, you should realise the fact that selling is also a skill that you can develop and master. You can read books on marketing and psychology or listen to podcasts from successful affiliate marketers like Pat Flynn so you can learn so much about selling online without sounding like a salesman. This is similar to mistake #2 but slightly different. You need to know a simple fact that most affiliate marketers take at least 6 to 8 months to start getting more sales to their affiliate products (even if they are very good at selling and promoting their products). This gives you an idea about how much should you wait until you start considering to quit. Affiliate marketing is not just about being an anonymous guy on the net and hoping to millions of dollars each year. It doesn’t work any more. You’ve to build a personal brand and set yourself like an expert in your industry if you are for the long game of affiliate marketing. Here are few tips to improve your personal brand which in turn helps you boost your affiliate sales. Post long form of content: We can’t tell you how important long form of content is. Not only it ranks well on Google but also it helps you establish yourself as a thought leader in your industry. After all, not everyone can write 3000+ word blog posts without having deep knowledge, right? Start vlogging and share your personal stories: Most affiliate marketers don’t share their personal lives which we think is essential to set yourself as an expert and people easily get connect to personal stories. Start a podcast: This is one of the super fast ways to boost your personal brand as most people are afraid of doing podcasts. Start interviewing other bloggers in your industry, start small and grow big. And they expect great results from their affiliate marketing campaign. Here’s a video of how you can find best affiliate programs to promote (made by us). Then what should be your primary goal to make more money out of affiliate marketing. What is the unique affiliate profit model then? Here it how it goes..
A research says that “promoting a product by releasing a video about it features and benefits can boost affiliate sales to 70%”, so try to create videos at least on few of your targeted products that sell more. Never underestimate the power of social media as it can help you easily increase your personal brand along with traffic and sales to your sites. Instead of picking too many platforms at a time, pick one or two. Start growing your audience and engage with to boost your personal brand. Do you want to know why majority of the people who dive into affiliate marketing never make at least one affiliate sale? There may be a ton of reasons behind not making enough affiliate sales, but here are few of the major reasons we observed over the years. Try to avoid them and you’ll be successfully making a ton of affiliate sales even while you sleep. Finding out your targeted audience is the most important aspect of boosting your affiliate sales. Without knowing your readers, you will NEVER make decent affiliate income, in fact you could end up earning nothing! So find out to whom you are your selling to. Know your potential products that can bring massive income from your sites. It will become easy for you to make affiliate sales once if you know your targeted audience. The second step is to care about them. No one will trust you if you promote mediocre products. Just because a product is paying high commission, you should not recommend it to your readers. If they find no value in the products that you promote, you won’t be able to gain their trust again. By promoting the products that you personally use on your blogs, you will have a better idea of why they are important to your readers and you will also be able to convince them why should they care using them. Write genuine reviews about the products and services that use. If you write unbiased reviews about the products, you will find more response and sales from your readers/customers. Most failure affiliate marketers don’t have a solid strategy. What does it mean? Here’s what we mean when we say to have a strategy to make more sales from your affiliate websites in 2019. The following are the 5 essential pillars of a successful website strategy which help you increase your affiliate sales even if you’re a beginner. Content marketing strategy: Content is the king when it comes to increasing your sales online. It doesn’t matter what industry you are in, you need to create long form of highly useful content for your target audience in order to increase your affiliate sales. Without great content, it’s impossible to convince people to stuff buy from you. That’s why you need to lay out a content marketing strategy where you need to plan your content in advance. SEO strategy: Your keywords, content, user engagement, website speed – all comes into play when it comes to developing a SEO strategy. If you’re really serious about building a profitable affiliate related website, you must get serious about SEO. Here’s a simple tutorial that helps you lay out a great SEO strategy for your website. List building strategy: Just like SEO, you also need the most essential part of build a successful affiliate site which is your email list. You should figure out ways to turn random visitors of your website into leads and them into loyal subscribers. Offer freebies, give free stuff too often, do more than your competitors and that’s how you’ll be able to grow your sales really quickly. Promotion strategy: Content alone won’t help you increase your affiliate sales, it’s your promotion strategy is what helps you stay ahead of your competition. It includes social media promotion, list building, guest posting for linking and so on. Monetization strategy: Without having a monetization plan, it’s impossible for anyone to make more affiliate sales through their sites. Every successful website that makes more affiliate sales has a monetization strategy (you can also call it a blog sales funnel). A blog sales funnel is what helps you turn normal visitors into email subscribers into buyers. Have the above 5 pillars right and you’ll have an amazing affiliate website that makes money even while you sleep. Why no one is buying your affiliate product? Never treat affiliate marketing as a get rich quick thing: that mindset is what makes most people unsuccessful in making more money from affiliate marketing. Although you don’t have to be super smart to increase your affiliate sales, but you need to work extremely hard if you want to succeed. Because affiliate marketing involves in competitor analysis, SEO, building backlinks, increasing your conversion rates and so on. In a nutshell, you must know how to sell to REAL people. You can’t make that simply by promoting your products that your readers are not interested in. You have to find know their needs and wants, then promote the products that solve their problems. So what are your thoughts about using affiliate marketing to make more money? Share your views in the comments below. Awesome Post as Usual ? Hi Priya, right said, affiliate marketing doesn’t require any special operating costs, you can make even while sleeping and no risk at all. The only bad thing is it takes time especially when you’re new into it. Hey Anil, Nice guide on Affiliate Marketing. Most of the people start targeting high competition keywords when it comes to Affiliate Marketing and end up find it hard to rank among hundreds of affiliates who uses advance SEO Techniques. Hi Mike, true that most people start targeting high competition keywords when it comes to affiliate marketing and end up find it hard to rank among hundreds of affiliates, so right. That’s the reason why you should always go for low competitive long tail keywords. Thanks for writing an amazing and in-depth article. I think the first step is to choose right products and then write how-to posts, reviews, etc. And of cause networking with influencers is it essential. Yes, the first step is to choose right products and then write how-to posts, reviews etc which is extremely important. If you pick the wrong products, no matter how much traffic you get, you won’t get sales. Very informative post. Affiliate Marketing is one of the best ways to monetize your blog and make passive income from it. Building trust among your reader is very important to increase your affiliate sales. Choosing right and an adequate product is very important to increase conversions. Thanks for sharing these helpful tips here. Yes, Affiliate Marketing is one of the best ways to monetize your blog and make passive income from a site no matter what industry you are in. But you need to also understand your competitors strategies to outrank them. Otherwise you’ll find it hard with time. Very detailed article about using affiliate marketing. The points are exactly what should be done to become successful in internet marketing. There are many marketing networks that provide the information needed to get started in affiliate marketing. Once you understand how it works and take action, then you will eventually end up making money and by the way please do check out my website. Thanks for this awesome article. We should always learn and apply. Hi Fahad, yes, once you understand how it works, you can make a ton of sales. The key here is to give huge discounts and create excellent product reviews so you can make more sales from your blog. What an incredible article on affiliate marketing best practices. In fact, affiliate marketing is one of the best ways to make passive income from your blog. The opportunities it offers are endless. But many bloggers find it very difficult to make money from affiliate marketing, thus they shy away from affiliate marketing. As your showed in this article, choosing the right product and promoting it properly will certainly get you going on the right path. But how can you identify the right affiliate product to promote on your blog? You mentioned that one should make a list of competitors and study the products they’re promoting, then identify they that are relevant. You did an awesome job Anil. Keep rocking! Hi Moss, what an excellent comment. Yes, it’s a great way to earn passive income but the thing is it getting saturated just like any other popular source. That’s the reason why most people are finding it hard to make money from affiliate marketing. By choosing the right products and creating the right content, you can definitely make a ton of money. Yes, less is more when it comes to affiliate marketing. Pick few products and promote them well if you want to get ahead in the affiliate marketing game. Thanks for this info,and on my own opinion affiliates marketing isn’t not only way to make money online with a blog, it’s a way to help us improving relationship with others, when you want to sell some thing, you have to get trusted first, from your buyers, and of course, you have to find the way to do it, it also is a way affiliate marketing helps you improve your skill. Yes that’s so true. If you want to sell some thing, you have to get trusted first, from your buyers, and of course, you have to find the way to do it (either through content marketing or smart selling). Otherwise, you won’t get even a single sale. great post about affiliate marketing here. Definitely, it’s one of the most lucrative ways to generate a passive income online. However, not every blogger are able to get good money out of it. Using the right tools, producing great content, solving your audience needs and problems, choosing relevant products or services to promote are some tips to reach success with affiliate marketing. Hi Erik, yes affiliate marketing is a lucrative way to make money from online but most bloggers don’t make it for so many reasons. Either they think it as a get rich quick scheme or don’t put much efforts for a long time. Its all on use, what we want, I think your word “don’t tell them to buy” is work great but what we should used words instead of these words that’s why our conversion will grow? Yes, don’t tell them to buy. Show them enough reasons and if they like your recommendations they will buy. Trust is everything when it comes to online. AdSense used be great but not any more. So you need to rely upon new sources like affiliate marketing to be able to make more money. I’ve done some affiliate marketing over the years and one thing that seems to help is if the product comes from the same country that most of your audience is in. I think they just tend to identify more with it, and their sense of trust goes up. So they’re more likely to buy. I know that this wouldn’t help a lot of affiliate marketers, since their blogs aren’t geo-specific. But if they are, considering this factor can help a lot. Hi Matt, that’s true, when you define your target audience and market the right products, they will definitely buy stuff from you. That’s why defining target audience is so important to generate more affiliate sales.